Dress Code, The black-tie. Ladies, Long Dress, Gowns, Gentlemen Business or Tuxedo. No one in jeans, tennis shoes, flip flops or shorts. IMPORTANT: Warner Bros. Studios has a very strict security policy where all guest names must be provided prior to the show. Therefore, please ensure that you list all guests’ names exactly as they appear on their driver’s license/ID when purchasing tickets. The person who purchases the tickets will receive a confirmation that each guests name has been added to the guest list. 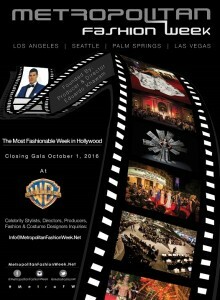 Metropolitan Fashion Week Closing Gala and Fashion Awards will take place Saturday, October 1 at Warner Bros. Studios, and will recognize outstanding contributions in costume design, celebrity styling and more. The award categories include Costume Designer of the Year (Motion Pictures), Costume Designer of the Year (TV), Costume Designer of the Year (Live Performance), Celebrity Stylist of the Year, Fashion Program of the Year, Fashion Commentator of the Year, Fashion Blogger of the Year; Make-Up Artist and Hair Stylists of the Year (TV/ Motion Picture) and MFW Excellence Award. In addition to the Awards ceremony, the evening will include a one-of-a-kind fashion show featuring haute couture gowns and costumes and exclusive Presentation from Cirque Du Solei, Las Vegas. Important notes: We recommend that all guests arrive by 7:00pm. Please allow additional time for parking. All guests must be in their seats by 8:20pm. Any empty seats will be filled at that time.